Available Now: What Are You Gonna Do with that Hair? Everyone knows Zuri as “the girl with the puffy hair.” Her afro is big and fluffy, and not even gravity can keep it down. People often ask her, “What are you gonna do with that hair?” Zuri finds the answer in her cultural hair-itage and shows she can sculpt and shape her curls and coils into beautiful works of African art—braids, ‘locks, bantu knots—in other words, whatever she wants! 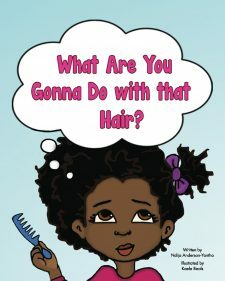 This illustrated non-fiction book encourages Black girls to celebrate the beauty and versatility of their natural hair and learn the rich history of natural hairstyles. Available in Canada on Amazon.ca: Click here to purchase. Also available in-store at Knowledge Bookstore: 177 Queen Street West, Brampton, Ontario L6Y 1M5. Available in the United States on Amazon.com: Click here to purchase.